The City of Hamilton has advised that repaving at the junction of Court and Angle Streets will begin at 6:00am on Thursday [Sept 13]. 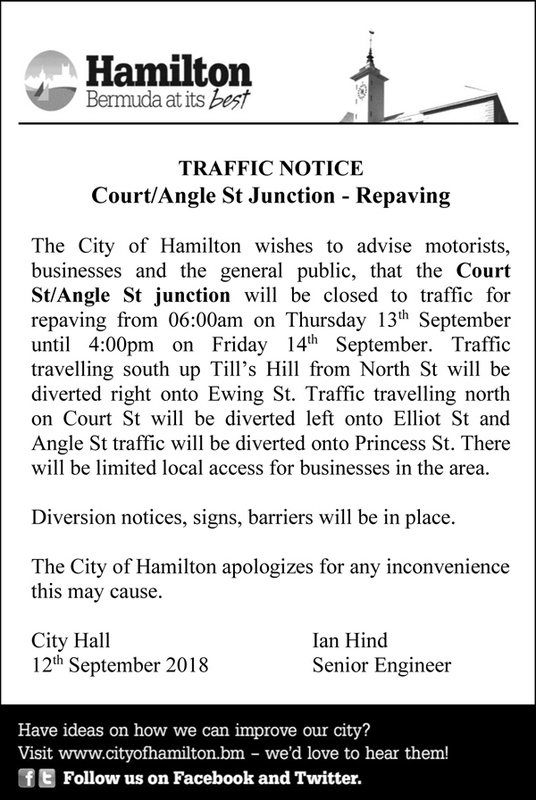 A spokesperson said, “The City of Hamilton advises that repaving at the junction of Court and Angle Streets will begin at 6:00am on Thursday, September 13th. The junction will be closed until work is completed, estimated to be by 4pm on Friday, September 14th. “The junction closure will affect traffic flow in that area. Traffic traveling southbound on Court Street from Till’s Hill will be redirected right onto Ewing Street; traffic traveling northbound on Court Street will be diverted left onto Elliott Street and Angle Street traffic will be redirected to Princess Street. Senior Engineer, Ian Hind, says of the repaving, “The City will be hand delivering the traffic notice to as many residents and businesses in the direct area that may be affected by the repaving. “We realize that the short notice is not ideal but we had to jump on the chance to get the work done so that the improvements could be done as soon as possible. By Friday afternoon, a newly paved road surface will be a benefit to all.